I quote this spiteful description because of the identifiable falsehood: as we've all seen from the photos, there was no barrier. Either Mickens was making it up, or (more likely) he was relying on a garbled second hand version. What is clear, however, is that he didn't bother talking to any of the 'kids' involved or looking at the pictures on the Internet, which went up within hours of the events they captured. What a terrible thing photography and the Internet are for liberal fantasists like Robert Mickens. We don't have to take their word for anything any more. There should be a short article on this confrontation in the next Mass of Ages giving the story from the horses' mouth - from the young chap in the middle of the photo. 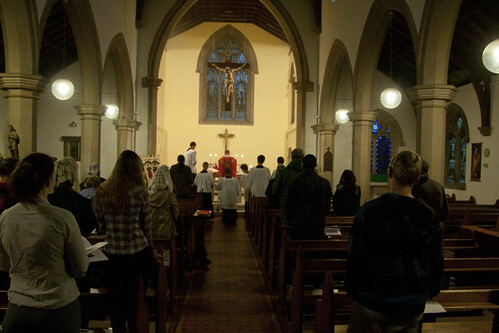 Sung Mass in the Catholic parish church in Ely, St Ethelreda's, early in the morning on Friday. 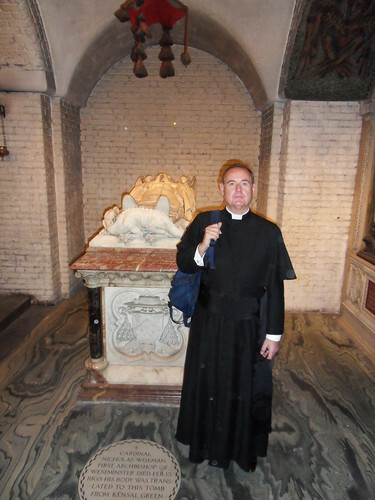 Fr Shyrane, the parish priest, is extraordinarily welcoming to the many pilgrims who pass through. We had our dinner on Thursday night and breakfast after Mass in the Presbytery, and most of the ladies slept on the floor. The men were in tents in a camp site outside Ely. 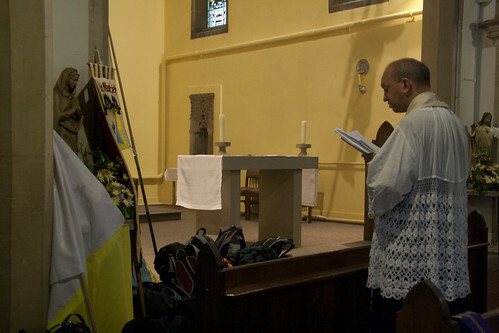 After Mass Fr Bede Rowe, our chaplain, blessed the banner, and gave the blessing used at the Christus Rex pilgrimage in Australia, of the pilgrims' 'staves and scrips' (our sticks and daysacs) and of the pilgrims themselves. 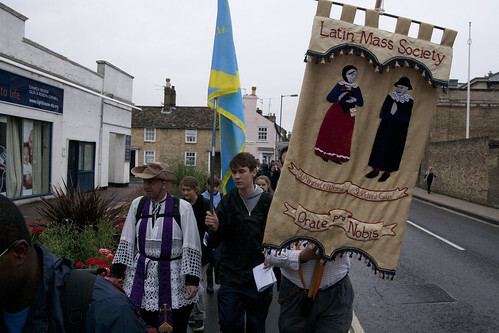 The banner has its first outing, on the way from St Ethelreda's to Ely Cathedral. 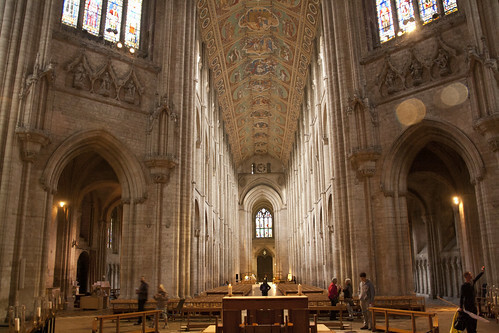 Ely Cathedral, a medieval masterpiece. 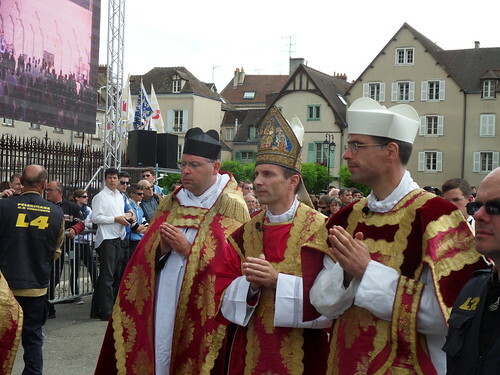 We prayed there for the healing of schism. Shortly after leaving Ely it began to rain intermittently, including some quite heavy rain. 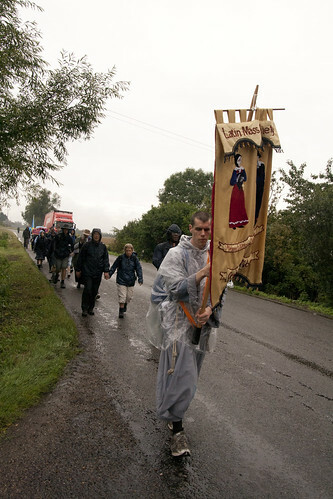 The banner is being carried by Br Julian of the Friars of the Immaculate, based at their community in Stoke on Trent. 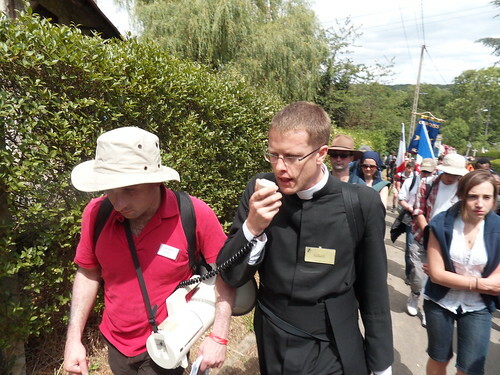 Also with us from that community was Br Pietro, an excellent singer, an Italian who has been in England only a month. We were very privileged to have them with us. Dinner in a school where we stayed Friday night. Paul Waddington and Lucy Shaw were in charge of providing the food; we did very well. In the school we were all able to sleep under cover, in various rooms and corridors. 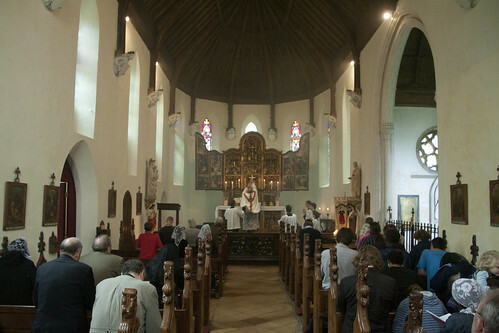 After a short walk we had a Sung Mass in the chapel at Oxburgh Hall, at 9am. We were joined by a number of local LMS supporters. Walking on from Oxburgh, after a cup of tea very kindly supplied by the Bedingfelds, and a look at the very interesting priest-hole - I'll blog about that separately. It was much brighter, and despite thunder and lightning at one point the rain was limited to showers, with a couple of impressive rainbows during the day. At a pre-Reformation Priory we said prayers for the dead. Saturday night we were in a village hall, where some very kind local ladies prepared a meal for us. The men were again in tents outside, about a dozen tents, mostly one-man 'pop up' tents, with the ladies on the floor in the hall. 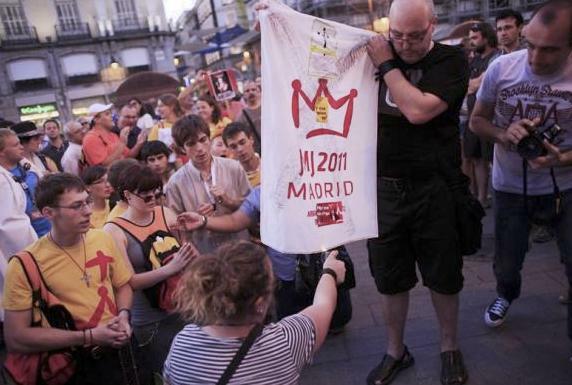 Before bed we venerated a relic of the True Cross, which one of the pilgrims had brought with him. 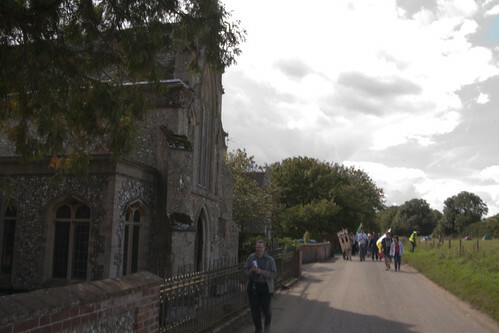 Sunday morning, a fairly short walk to Walsingham. 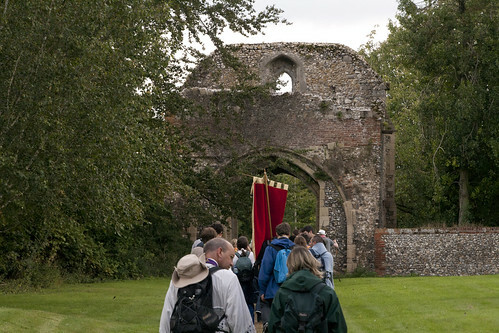 Arrival at the Slipper Chapel, the Catholic shrine, part of the medieval shrine complex: it is where pilgrims left their shoes for the Holy Mile to the Holy House in Walsingham itself. 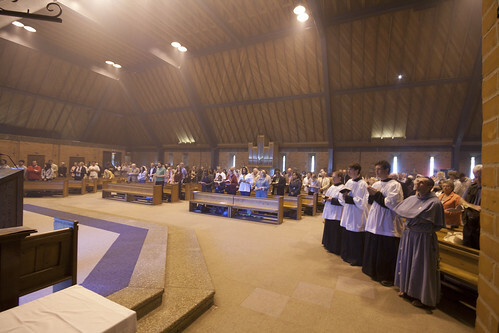 Sung Mass in the modern Reconciliation Chapel. 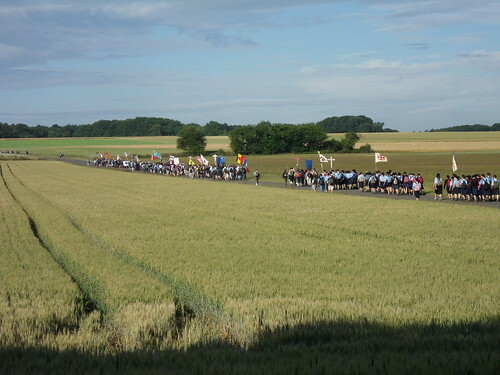 Our numbers now include not only the walking pilgrims and our various support drivers but a coach-load from London, many other LMS supporters from around the country and a number of young people taking part in the Youth 2000 weekend taking place. 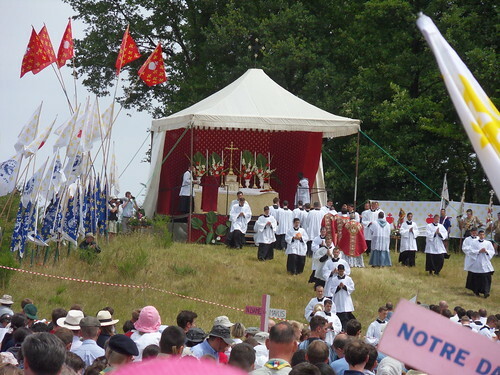 Y2000 is such a big event that they have their services in vast tents in the field opposite the Slipper Chapel, so it didn't prevent us from booking the Reconciliation Chapel for Mass at 2pm. 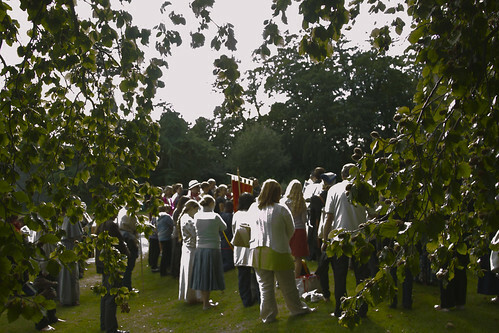 We processed from the Reconciliation Chapel to the site of the Holy House in the grounds of the medieval Abbey. 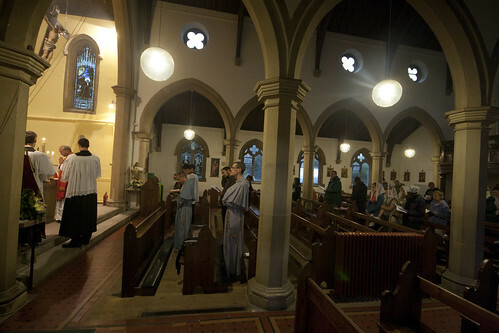 Here we sang the Te Deum and had a final blessing from Fr Bede. The site of the Holy House. The full set of photos. I've been processing the photos taken with my proper cameras and they are uploading now; I'll post about the Pilgrimage tomorrow, but you can see the photos here. 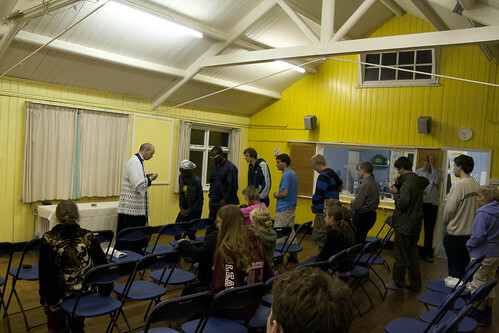 Mass in the Parish Church of St Ethelreda in Ely, the in the early morning of the first day of the pilgrimage. After a long morning's walk we made it to the Slipper Chapel, the Catholic shrine, in good time at 12.30. We had prayers outside the tiny historic chapel, where medieval pilgrims left their shoes to walk the Holy Mile to the Holy House in Walsingham. 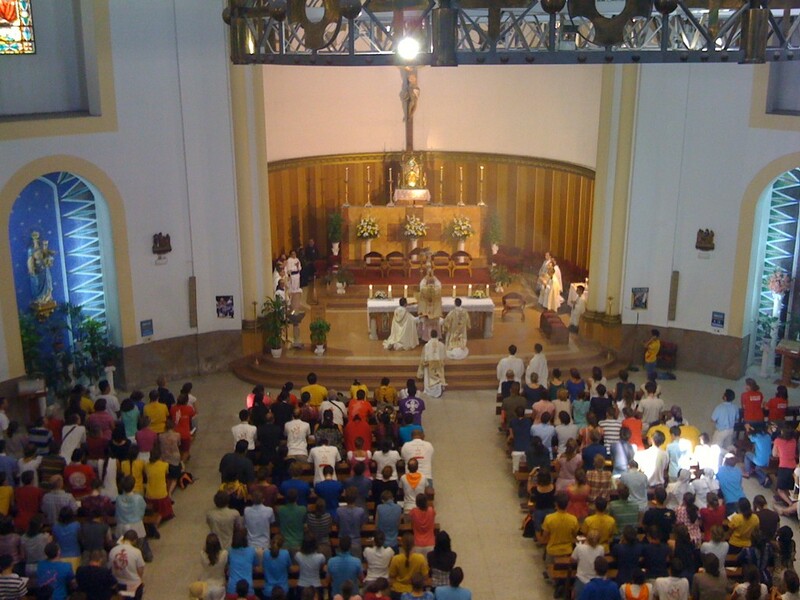 We were able to visit the chapel individually and prepare for Mass. Fr Rowe celebrated a Missa Cantata for us at 2pm, with the Asperges, a Votive Mass of Our Lady since it it a recognised shrine. This was in the large, modern 'Chapel of Reconcilation', and was extremely well attended. 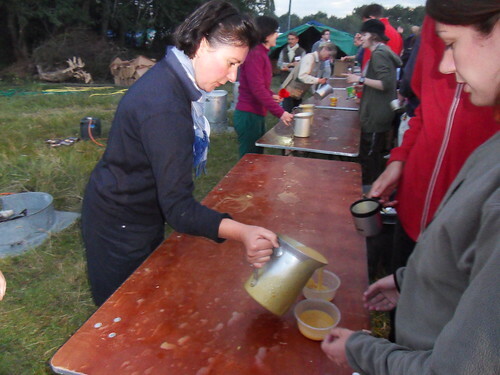 In addition to our thirty foot pilgrims and about a dozen 'camp followers', there was a coachful from London, others from around the country and visitors from the 'Youth 2000' event taking place over the weekend. 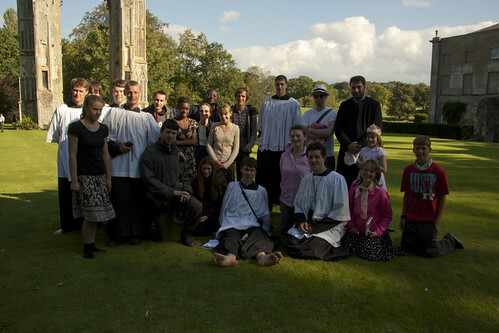 After Mass we processed to the site of the Holy House and sang the Te Deum with 130 people. Yesterday continued with showers, but with a lot of warm sunshine as well. We stopped to pray for the dead in the ruins of a pre-reformation Priory: we sang the Dies Irae and De Profundis, and Fr Rowe led us with prayers. It was a long afternoon's walk - after a long morning's walk! We persevered with almost continuous singing, which is the key to keeping up morale, though my voice is suffering a bit this morning. We arrived at last at Harpley Village Hall, and after a meal prepared by some very kind local ladies we visited the Crown pub and had a very jolly evening. 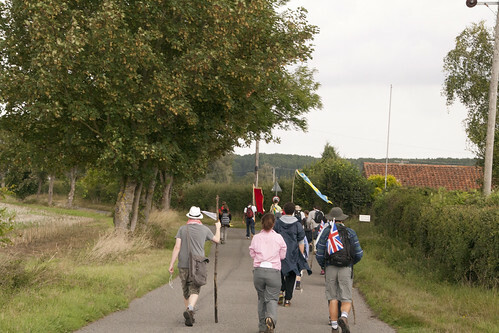 We are now well on our way on our last leg to Walsingham, having a break in East Rudham, whose village sign has a picture of pilgrims making their way to Walsingham. We have had a beautiful Sung Mass in the private chapel of the Bedingfeld family at Oxburgh Hall, and after a cup of tea and a look at their priest hole (hidden under the loo ensuite to the 'Kings Bedroom) we have had a long walk to get to Narbrough. The weather has been much better today - a few light showers but also a lot of sun. After lunch we'll be walking to Hartley for the night. 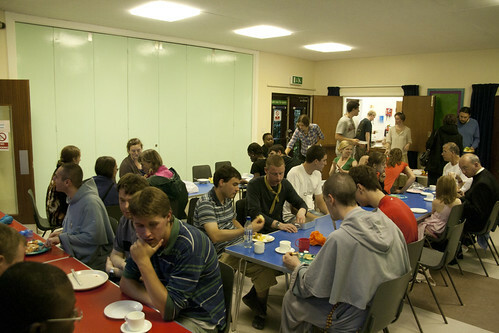 We've all arrived in Ely, pitched our tents and had dinner in the presbytery of the Catholic parish church, St Ethelreda's. There are far more of us than last year, about 30, so the ladies have the use of the presbytery floors and the men are in a camping site. Dinner presented some difficulties because we couldn't get the oven to work; however we overcame and had a very agreeable and sociable meal. 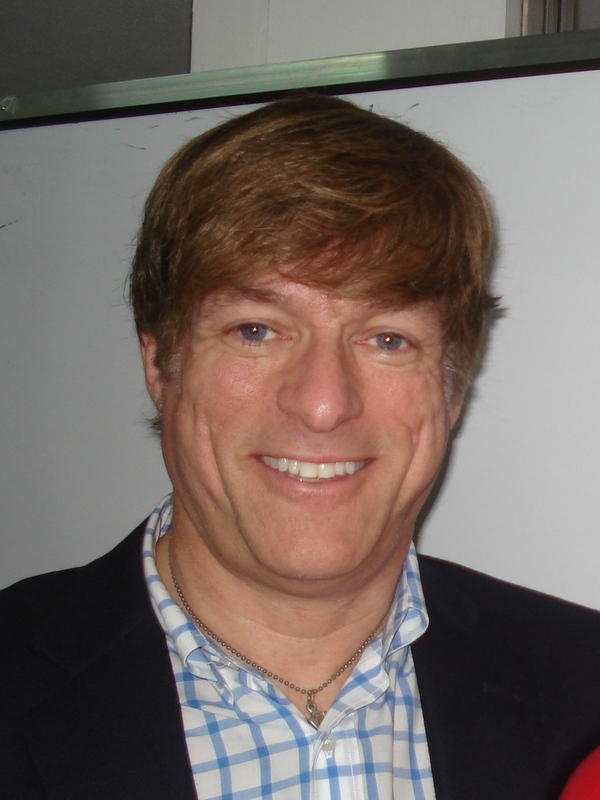 I've listened to a few of his video broadcasts and I must say I'm fascinated to see him in the toupée - I mean in the flesh! Oddly enough I saw a picture of him on a recent visit to Warwick Castle. They called him Prince Toby for some reason - it was in part of the castle dedicated to entertaining children. He looked a little younger. 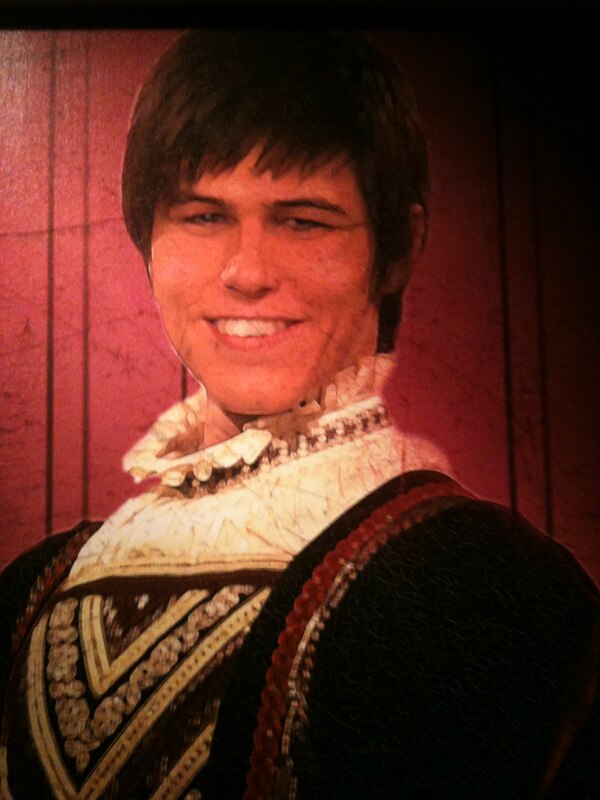 He'd like Warwick Castle, in fact, judging from this photo of him. Well done to Smeaton's Corner for arranging the event - go to him to get a ticket. 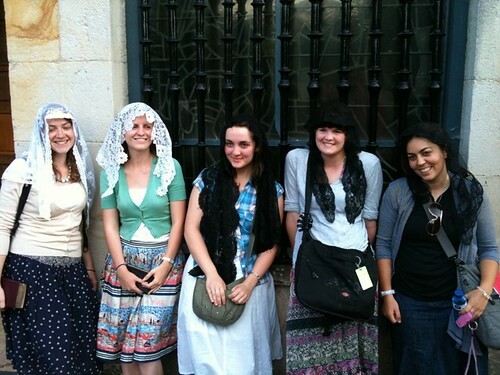 Here is a photo from Rorate Caeli, which has been carrying some reports. 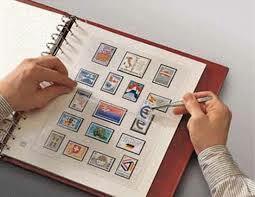 These are taken by a British pilgrim so they show the UK chapters particularly. You can see them here. They are a particular 'must' for fans of Fr Alexander Redman. 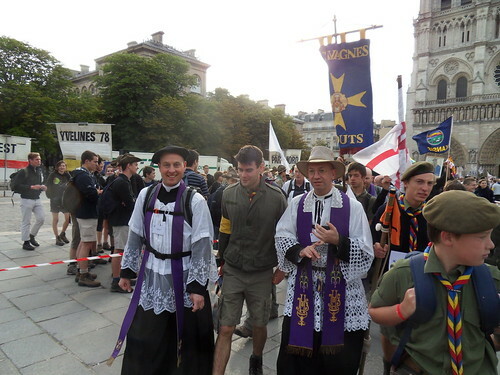 Here he is disguised as a Frenchman, next to Fr Bede Rowe. 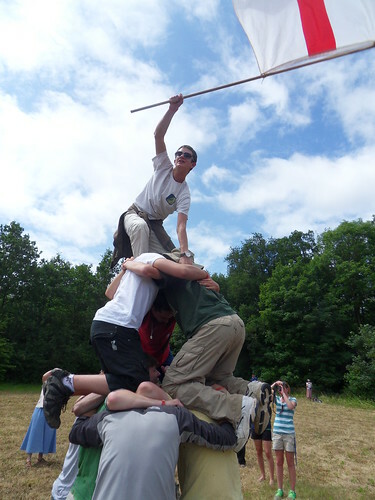 It seems Fr Rowe is already looking after the Chavagnes boys, to whom he will be School Chaplain from September. 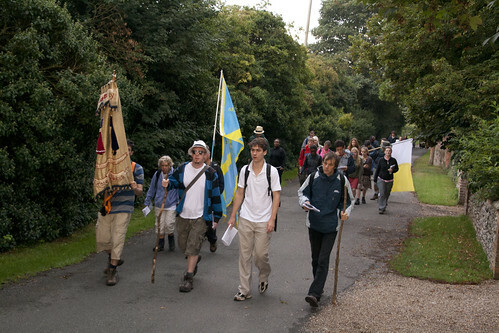 Anyone (like me) who was left behind can still sign up for the LMS Walking Pilgrimage to Walsingham. See the side bar. 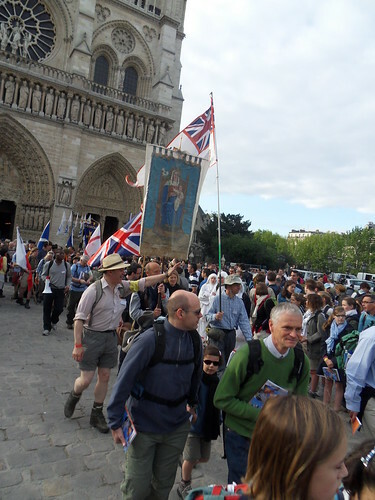 We can't promise it will be quite as gruelling as the Chartres Pilgrimage but it will be fun all the same.